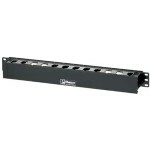 Organize your cables in any rack or cabinet that's 20U or larger, using this vertical cable management panel. This 3-foot vertical cable manager gives you a simple and space-efficient way to organize the cables in your server rack. 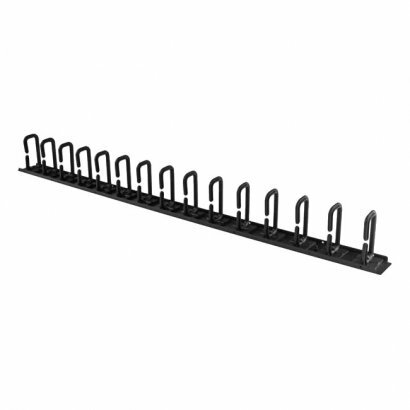 You can attach the cable manager vertically into your rack, to neatly guide cables between equipment that's mounted at different heights.The 0U cable manager offers versatile installation options and is compatible with most racks that are 20U or larger. 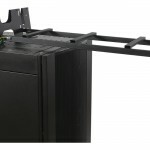 The panel features a 0U design that doesn't take up any mounting space, and with simple tool-less installation it's easy to attach or reposition as necessary.Improve the appearance and accessibility of your rackThe cable manager uses a D-ring method of cable management to run cables vertically along the side of your rack, neatly guiding them between equipment that's mounted at different heights. 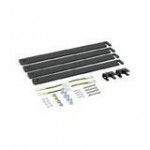 This provides a tidy and well-organized way to run cables from devices mounted toward the bottom of your rack to other devices mounted near the top, without leaving a mess of cables hanging in between.Having neatly organized and routed cables not only improves the appearance and accessibility of your rack, it also makes it easier for you to install, access and maintain rack components.Hassle-free compatibility with your rackFor maximum compatibility with virtually any server rack, you can install the cable-management panels using mounting holes that are commonly found on most rack equipment. 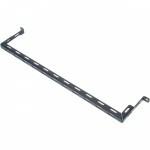 The tool-less mounting method attaches the cable management panel to the keyhole-shaped mounting holes that are built into your rack.The horizontal mounting rail method attaches the cable management panel to the horizontal mounting rails that run along the side of your rack.For racks that don't support these installation methods, you can also mount the cable management panels through other means, such as using the non-standardized holes found on your rack walls and enclosures, or the rack units on equipment mounting rails.Protect your equipmentRouting your cables through a panel reduces the tension that's often put on cables. 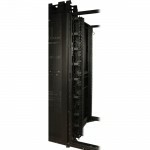 This prevents cable damage or connection loss, and reduces strain on equipment ports, preventing damage to your expensive rack-mount devices.Properly routing cables also improves airflow, which passively cools devices stored in your rack, helping to keep your equipment running at optimal temperatures to reduce the probability of damage caused by your rack overheating.The CMVER20UD is backed by a StarTech.com 2-year warranty and free lifetime technical support.